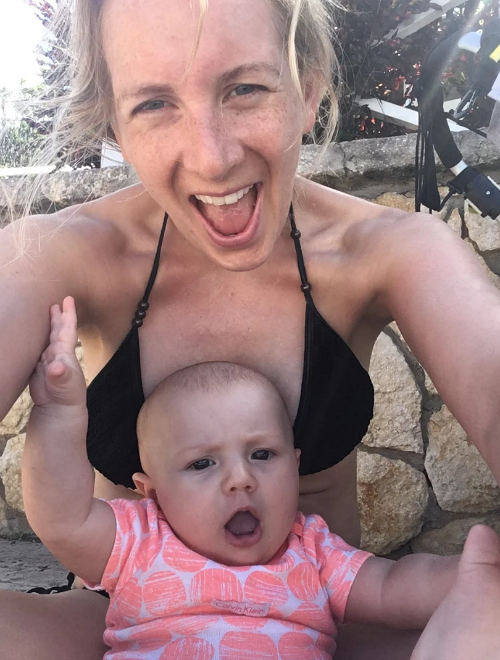 Mummy & lifestyle blogger, Stephanie who recently featured in the latest ‘This Girl Can’ campaign alongside her little girl Olivia shares her top tips for getting fit post baby. Doing exercise during pregnancy is tough for both mental and physical reasons, fear of doing harm to your unborn baby, fear of judgement for exercising and people telling me I should be sitting on the couch resting and eating for 2 (well I did listen to this advice some days!) and also physically getting used to your body changing shape. But week by week as I could see my bump grow and kick I felt more confident that I was doing the right thing for me and my baby and trusted my body to tell me when enough was enough. Being pregnant takes a huge toll on your body and I do believe that without taking part in the special pre-natal fitness classes I would’ve ended up doing more harm to myself. Making sure that I was stretching out enough to alleviate my back pain, building up my arm muscles to ensure I could physically cope with lifting a baby all the time. We’re talking lifting 2kg weights – my little girl came out at 4.1kg and by 5 months has now pretty much doubled her weight. I dread to think how I’d have coped without these classes! As a first time mum I soon learnt that you don’t get ‘sick’ days from your new job! So when it came to getting back to exercise post baby I was all raring to go until I realised I had severe abdominal separation (3.5 fingers!). I spoke to the instructors at my gym who welcomed me to their postnatal classes (you have to have had your GP 6 week check up before attending) that specialised in helping mums recover and get their body fighting fit again. Not only have I been able to do something with my little girl that I really enjoy it’s also introduced me to a whole new load of mums and friends that make maternity life even more rewarding. 1. Take it slow and low impact. Your body has just gone through this crazy amazing journey carrying your baby for 9 months! Why the rush to put it through anything more intense. Whether you’re suffering with ab separation, recovery from a C-Section or just a ‘normal’ birth your body still needs time to heal and mend. Little and often is key. Just 15 minutes a day will make the world of difference. 2. Ditch the scales & dress sizes. The media are too quick to promote these supermodel mums bouncing back into their skinny jeans straight from the hospital. You have enough on your plate so don’t focus on weight and size. If you’re breastfeeding you’re retaining water and have extra weight right in front of you! Just concentrate on building back up your core strength. A strong core is more important than getting back into your jeans. With the constant carrying and picking up/putting down your back will take a hit so you need to protect yourself. 3. Join a local mums & baby’s class. Whether you’ve always been a fitness junkie and are keen to get back on it or you’ve never really visited a gym in your life it doesn’t matter, I would totally recommend it. I found these classes a great boost for morale especially on the days when you feel like you don’t want to leave the house. Being around a group of mums who all know exactly how you feel and can either laugh/cry with you or give you some top tips. There is no judgement in these classes and just a real sense of community. You’ll forget you’re even exercising! 4. Walk it out. Put the baby in a sling or stroller and go for a walk. I found that even on days when I felt like I had no sleep just 10 mins of fresh air made all the difference to both baby and me. I make sure that I get out every day even if just to pop out to treat myself to a coffee. Walking is a great low impact exercise and why not rope in some of your mum friends to join you. 5. Pelvic floor! Now you’re probably bored to death of hearing about this but I can’t stress how important it is. Even if you feel fine post birth it’s still as important as ever to do these every day. What you do now makes a difference and protects yourself for later on in life and for future pregnancies. Put reminders in your phone to do them or invest in an Elvie – an exercise tracker for your pelvic floor that links to your phone via an app .